The Fett(a) cheese is no more. Electronic Arts has detailed what's new in the latest patch for Star Wars Battlefront II. While the prior patch addressed "critical gameplay and user interface issues", 1.03 heralds a new End of Round MVP screen that will focus on scores and not "specific honors" in a bid to diversify the number of names listed on the MVP summary. "We have also focused on doing a pass on collision and traversal issues on Jakku, Kashyyyk, and Endor as well as tweaks to the combat areas on Tatooine, Endor, and Hoth for certain game modes," said community manager Mr_Taver on the official forum. "This means that movement are now more fluent and no weird or invisible barriers are stopping your movement." A full list of 30+ fixes can be found at the forum. While most are small tweaks and fixes concerning textures and environments, you will now find that Boba Fett can no longer capture objectives "while hovering high above the objective", players will no longer be able to start a round if the "pre-round requirements" are not met, and the time required to "complete interact objectives" has been reduced. Additionally, the amount of Score and Battle points gleaned from using the NT-242's Disruptor Shot or the LAAT Gunship against vehicles has been reduced. "So, what’s our next steps? We are working hard to improve the game in our upcoming patches and we keep an eye out for the feedback we receive from all of you," concludes the update. "In the upcoming patch, one of items we are looking at is balance changes for the Heroes vs. Villains mode." Patch 1.03 is available now. EA recently told its investors that removing microtransactions from Star Wars Battlefront II would not have "a material impact" on the game's projected earnings after it announced it had temporarily suspended Battlefront 2's premium currency. 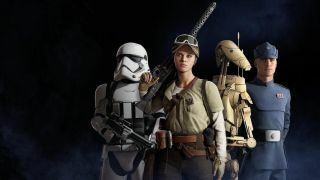 Despite EA CEO Blake Jorgensen stating this week that Star Wars Battlefront 2 doesn't have cosmetic customisation for fear of violating the canon, it appears the game does have that functionality after all.